It’s been quite a long time since our last newsletter! We’ve still been thinking about you. Here’s a short newsletter so we can touch base again. This image is a little teaser for both your appetite and the newsletter. I guess by now that you’ve seen our updated version of the software. Our current edition is 2018.1h. To find out what version you’re using, please follow the directions below. Go to the HELP dropdown in your software then select “About this software”. If you aren’t using 2018.1h, you can select “Check for updates” to download the most recent version. Carefully select your version. You can also download the update here. 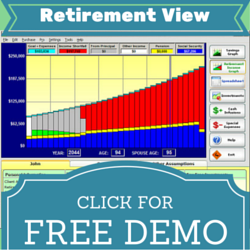 Go to the RETIREMENTVIEW dropdown at the top of your screen. then select “About this software”. If you aren’t using 2018.1h, you can select “Check for updates” from the HELP dropdown to download the most recent version. Carefully select your version. We’d love to hear from you if you have any questions, concerns or feedback.